The 90’s were an awful decade. Everything was so grim in England, grim in the cinema and grim in the charts. It wasn’t all bad though, as well as the pleasure of home consoles starting on 8 bit and finishing with CDs it also was the decade where I first went to an arcade. Arcade gaming ever since has been a true passion of mine, so much so a couple of years ago I bought an arcade machine and have re-built the control panel from scratch. One aspect of arcade games that cut me as a child was the fact I rarely had money. This meant I’d have to spread around the change I had, one life here, one life there, basically I would have to see how far I could get through The Simpsons, Final Fight, Alien Vs Predator or Dungeons and Dragons on a single credit. 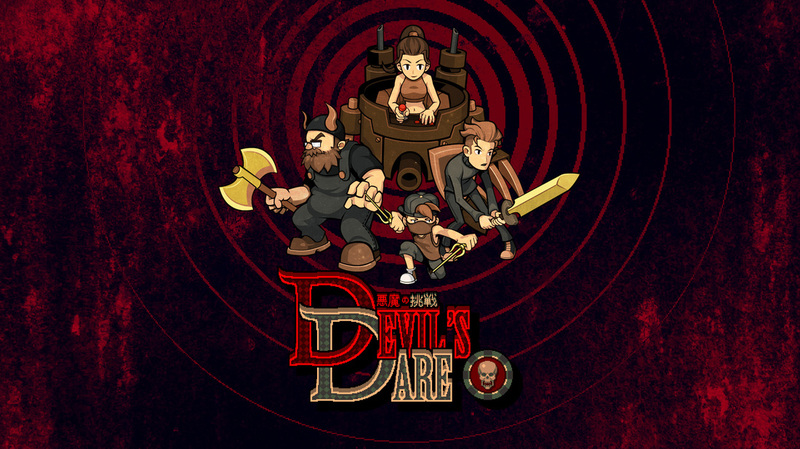 That mind-set is what brings us to Devil’s Dare in 2014, a side scrolling brawler with clear arcade game inspiration. The pop-culture references are plentiful and the permadeath is brutal. That’s right, permadeath, I need to start with this so no one goes into this game under any illusion. When you start the game you pick a save slot, you choose your character and then you play. If you happen to die during your run through the world, well, the game literally comes up with the message “Deleting Save Game”. I don’t want anyone to be confused after my review, this game is hard and this game is cruel, though in its defence it does have the Devil in the title. In a world over run by zombies and monsters a group of ‘average Joes’ are enchanted by a little red fairy called Ivan. Each character gains untold strength and weapons. There’s Axel a guy with a bin lid and a stick who gets transformed into a shielded sword wielding guy (Zelda). There’s Kingston a guy with a beard, who gets transformed into a guy with a beard, and an axe (Golden Axe). There’s Jackson a kid who gets transformed into a kid with penchant for stabbing (TMNT, Streets of Rage). And then finally we get Queenie a lady who actually gets a transformation, she gains the ability to perform MECHMAGIC or Tech Magic or something (Final Fantasy VI). Though it isn’t fully explained it does appear that either she is sat in a mech suit, or the alternative explanation is a Full Metal Alchemist style accident and she actually lost her legs and is now forced to use this mechanical monstrosity to get around. What makes Devil’s Dare so interesting is actually it’s control scheme. Recently we’ve seen a slight resurgence of side scrolling brawlers, games like Castle Crashers, Sacred Citadel and Foul Play, but none of these have really kept the original game’s main selling point like Devil’s Dare has; a simple control scheme. Back in the arcades 3 buttons was always more than enough to do what you need when pummeling gang members in classic Capcom or other’s games. Devil’s Dare only requires a control method and two buttons, what I mean is that if you were so inclined you could play this game using an NES controller. Many will be confused as to how that is a selling point, but when you’re playing a game like Devil’s Dare that allows up to 4 players and is a rogue like with permadeath, having buddies there for some pick up and play is essential. Being able to say to someone this button is attack and this is a special attack button means that in no time someone has your back. 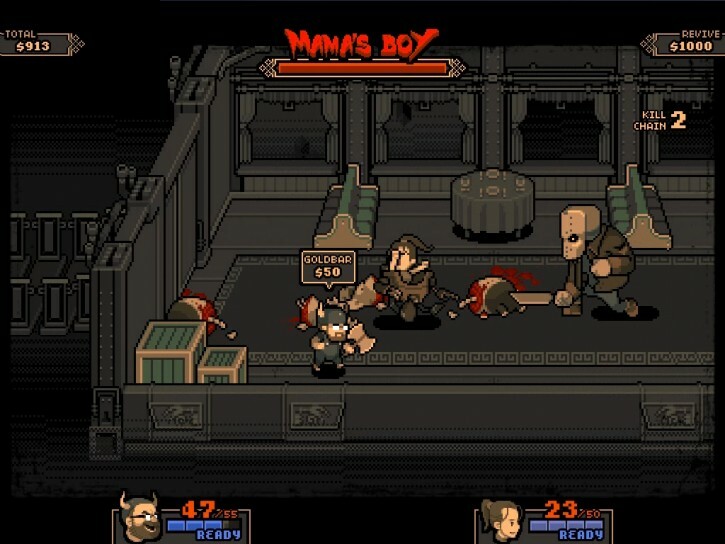 The game is littered with pop culture references, as you wander your way through the pixel world and fight monsters in sewers, castles, trains and streets you will come across various big bosses. Each of which will destroy you in minutes. In the early levels you’ll meet a Jason-alike, a The Fly-alike and Queen Alien-alike. This game is one Saved By The Bell Reference away from being the most 90’s thing to emerge since the 90’s finished. All of this looking back though does come at a cost, the game is, as I’ve mentioned numerous times, is hard to the extent where it’s off-putting. 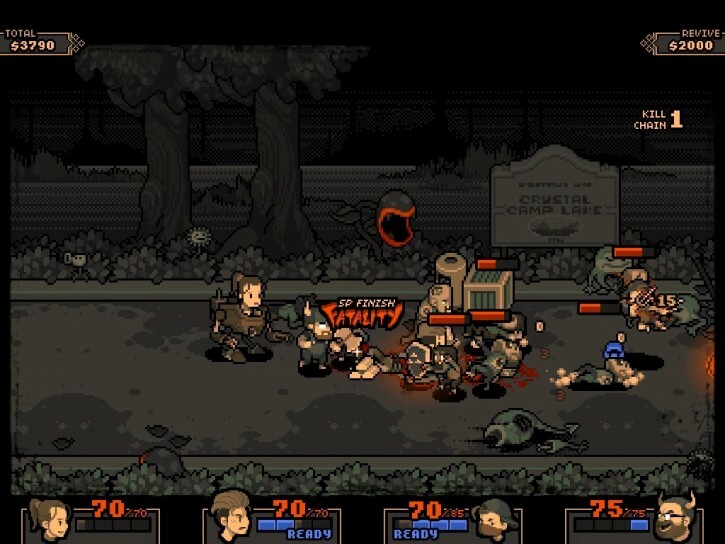 I had fun through the levels, I enjoyed the killing of zombies, knocking out pregnant monsters and dodging deranged dogs. But then I’d get to a boss, and I’d be taken out instantly. It’s hard to say whether this is because I’m playing it solo, perhaps in the games local 4 player co-op it’s a cake walk, but on my own? I struggled, a lot. I like the permadeath idea, I like the fact the game is trying to be like an old arcade machine, but that doesn’t help with the fact you end up seeing the opening levels over and over. I’m reticent to say the developer should have had a non-permadeath option, but maybe a difficulty setting? For some a difficult game is a selling point, something for them to master, I suspect in the case of Devil’s Dare this may be countered by the number of people giving up. All that aside, I had a blast with this game, it’s one I can’t wait to get hooked up in my arcade machine. If you can overlook the few issues it has with pacing and difficulty then you’re in for a good time. This is definitely a case of simple to learn but hard to master. Each character has different special abilities based on which direction is pressed, this is your key to survival. Axel’s hookshot especially is a must if you want to beat a boss, pull Mama’s Boy over and then cut cut before running like a little girl. With the crazy number of references to games, films and culture this is a game made for nerds by nerds. With some friends around and everyone willing to put in some time you could get far and have a blast. If you’re playing on your own then be prepared to die, a lot. This game isn’t for people who get stressed or angry when they die, you need to just accept it as fact and roll straight back in. The art and music of the game are clearly beautiful and the slightly sepia tones over the pixel art lead to a great retro feel. If you want a challenge, if you want to feel like it’s the 90’s again, if you want to crack open heads with characters referencing Golden Axe and Zelda; then you need to play Devil’s Dare. You can pick up Devil’s Dare on Steam right now! Previous Post When did the LAN Party Stop?